Bonobos and eastern lowland gorillas can only be found in this country! Country Information: The Republic of the Congo! The capital of Congo is Brazzaville. There are approximately 6 million people living here. The official language of Congo is French, with Lingala and Monokutuba as major trade languages and Kikongo as a widely spoken language as well. The majority of Congolese practice Roman Catholicism. The time zone is 5 hours ahead of EST. Congo is rich with cultural heritage and natural wonders. Adventurers cannot miss out on a safari at the Lefini Reserve. Livingstone Falls is a wonder! Located on the Congo River, these falls are a succession of enormous rapids. Most of all don’t miss out on the capital, Brazzaville with its ancient Belgian architecture and explosive nightlife, restaurants, and markets. An interesting fact about Congo is that both the bonobos and eastern lowland gorillas can only be found in this country. One of the first things that you will notice while exiting the airport in Brazzaville or Brazzi as the locals call it, it is not like most other capitals in Africa. What is different about it? Well, for starters, the streets are spotless. I mean you will have to search to locate a piece of garbage here. Unlike the rest of Africa, we’re garbage is strewn about and piling up in the gutters, the Congolese take great pride in keeping their city tidy. One can also walk or run without concern of being robbed or assaulted. 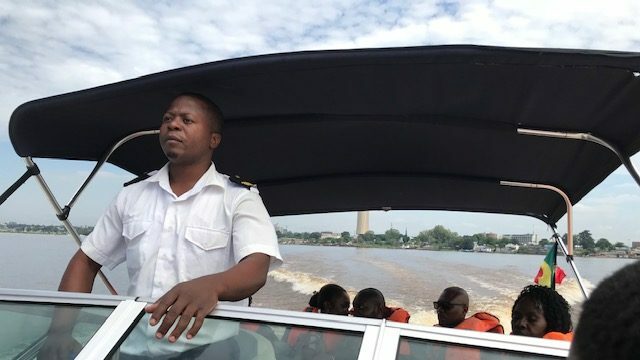 The best place to do so is on the promenade, just adjacent to the Radisson hotel overlooking the impressive Congo River and the skyline of Kinshasa, Democratic Republic of Congo. This area is a hub of activity. It also posts the best restaurants in Brazzaville, the Mami Wari. Although very expensive the pizza is as good as its views. Getting outside of Brazzaville, the roads are pretty decent, which is also anomalous to the rest of Africa. Heading north toward the Abio reserve, the rolling hills were lush green during the rainy season (in April and November). However a good roads only last so long in Africa and after two hours they reverted back to the continent’s mean: brutal! However, to truly see Africa you must earn it. To not have had the sh!t shaken out of you by potholes the size of astroid craters, is to somehow have cheated the system. To not have had to change a tire on the side of a busy road somewhere in Africa, or to not have driven through water up to your door handles is to have missed the charm and adventure this wonderful continent provides. Why? Because so much happens on these journeys, which are the lifelines connecting African villages to one another. Approaching the reserve, a full four hours outside of the capital, it feels like you’re in the middle of absolutely nowhere. You’ve passed a dozen or more places were people still stare at the white man (mizungu), a good sign of things to come. The scenery is breathtaking entering on the reserve’s rugged roads. This place looks like what you’d imagine Africa looking like 1 million years ago, a magnificent mosaic of savannah and forest, rolling hills and winding rivers. And what followed was the thrill of a lifetime, and at this point in my travels I’m not easily thrilled by anything. After boarding a small motorboat we were winding our way down one of the swollen rivers on the reserve. Apparently, during the dry season, it is full of crocodiles, but we didn’t spot any. Abio is home to 43 Western Lowland silverback gorillas, and we got to meet several of them. The first were FUBU and Choo Choo, brother and sister, and an entertaining duo. He was 20 years old in about 500 pounds and was jealous of the food that his sister received, always looking over to see what she got! 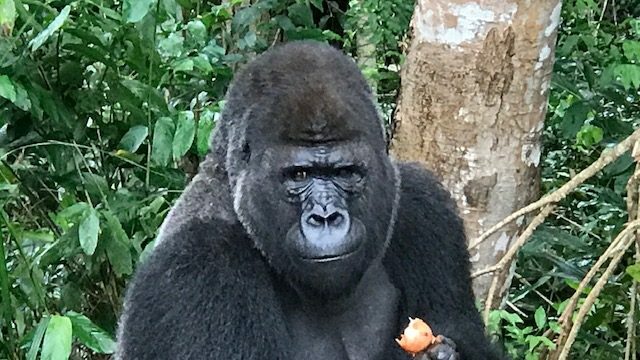 Next up was Kongo, who sat patiently by the riverside awaiting his food. He was quite the show off! When I said his name he turned to the side showing me how he munches his food. When you see a gorilla this size in the wild you’ll never forget it. It to be 10 feet from these magnificent creatures was even more unforgettable. I felt incredibly fortunate to have seen them and thankful to the Congolese government and organizations supporting this reserve. While these gorillas are a protected species, they are also hunted, commanding a high price at the market. It’s called “bushmeat” and can be found on the black market section of many local markets. Restaurants in this region regularly serve animal meat, such as zebra, antelope, buffalo, etc. However you can also find specialty meat such as elephant, gorilla, and monkey… gasp. Supply and demand. As long as people eat it, they will kill it. Sad but true. On the way back to the capital we went to see the Blue Lake, a beautiful spring fed body of water. Although I didn’t hike down to see it up close, the perch overlooking the lake and valley were spectacular. Overall, a great visit to the Congo! When I said goodbye to my guides, I felt that twinge that I feel when saying goodbye to a country that has captured my heart. The Congo was definitely one of those places! 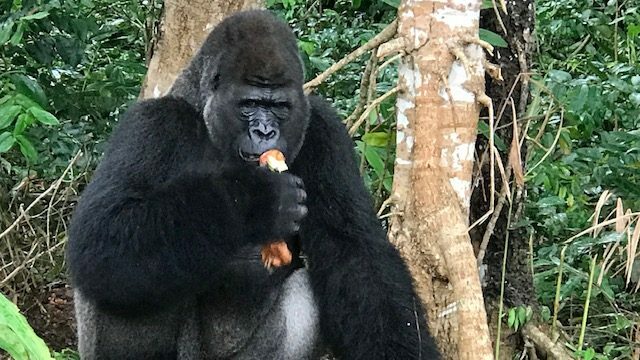 Kongo enjoying his favorite food … onions!